WILMINGTON, Del.--(BUSINESS WIRE)--Chase Card Services, the leading co-brand credit card issuer in the U.S., and Marriott International, today announced the new Marriott Rewards Premier Plus Credit Card. The announcement comes on the heels of last year’s renewal of the co-branded credit card agreement between the two companies, as well as Marriott International’s news from earlier today on the unification of its loyalty programs (Marriott Rewards, The Ritz-Carlton Rewards and Starwood Preferred Guest (SPG)) with one set of benefits. 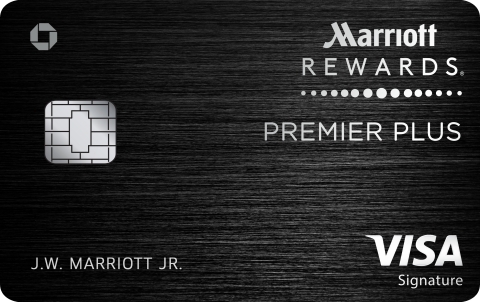 The Marriott Rewards Premier Plus Credit Card will be available starting on May 3, 2018, and will offer the richest rewards thus far on this card program, including a 100,000-point new cardmember limited time offer, 6X points on purchases at participating Marriott hotels, 2X on all other purchases, an anniversary free night certificate, guaranteed elite status, no foreign exchange fees and more. As an added cardmember benefit, beginning in early 2019 all Marriott loyalty program co-brand cardmembers will earn 15 Elite Night Credits towards the next level of Elite status, and annually every calendar year thereafter. Limit one 15 Elite Night Credit per Marriott Loyalty Program member. Benefit is not exclusive to cards offered by Chase. Terms apply. On May 3, 2018, Chase and Marriott will also introduce a marketing campaign that celebrates and empowers customers’ points of passion and purpose. For more information about the new Marriott Rewards Premier Plus Credit Card, visit Chase.com/GetMore. Chase is the U.S. consumer and commercial banking business of JPMorgan Chase & Co. (NYSE: JPM), a leading global financial services firm with assets of $2.5 trillion and operations worldwide. Chase serves nearly half of America's households with a broad range of financial services, including personal banking, credit cards, mortgages, auto financing, investment advice, small business loans and payment processing. Customers can choose how and where they want to bank: 5,100 branches, 16,000 ATMs, mobile, online and by phone. For more information, go to Chase.com.